Sally Melville loves all aspects of life as a ‘professional’ knitter: teaching, writing, designing, and explaining what this all means! And what does it mean? It means an extensive teaching schedule that takes her around the world, speaking to wonderful folk who can appreciate the perfect buttonhole, who love the textures and colors and techniques of knitting, who want to be more intuitive about their craft, and who know that life is about learning. 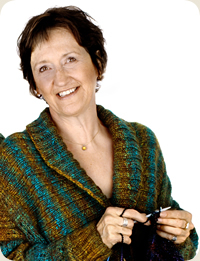 Sally has been teaching knitting for over 30 years. With a small group of her students she initiated the Kitchener-Waterloo Knitters' Guild, now with over 200 members and over 20 years old. Bringing in internationally-renowned teachers in the early years for her guild was a turning-point in Sally’s life: these wonderfully generous knitters were the folk who encouraged Sally to step into the same arena. In 1993 her life changed again, when her husband died. Left with two teenagers, she had to stop travelling and teaching. But she spent the next few years as the STUDY SKILLS ADVISOR at the University of Waterloo. This was an enlightening job that meant taking the material of how the brain works most effectively and turning it over to students to help them work more productively. These two fields (brain function plus her knitting) come together to produce some interesting material. And this material now takes two forms: short talks for those who knit or those who do not, and written ‘meditations’ on knitting and on life. Whether heard live or read privately, these writings are Sally’s favourite part of her work stimulating discussion, challenging basic assumptions, teaching us the value of being creative, of using our hands, and of paying attention to life. Sally Melville's newest book - Mother / Daughter Knits was just released by Potter Craft/Random House. BA (Hons Engl), 1972, University of Waterloo, ON CA. MA (Engl), 1974, University of Waterloo, ON CA. Artist-in-Residence, Joseph Schneider Haus, Kitchener, ON CA (2003).